I grew up in a family that made everything from scratch. My mom was the oldest of 12 kids and my grandfather, great grandfather and aunt were all artists. I thought it was perfectly normal to make candles and soap by hand and when we celebrated the holidays at my aunt and uncles we made pottery and all sat around watching the raku firing. I think my love of making as many foods from scratch comes from this upbringing. We grew up with very little money, but I never really knew. I knew that my mother was a beautiful seamstress and for one of my birthday parties we went to the beach and made sand candles. My friends talked about the candles that they made for years to come. The idea of not spending money on things that you can make or re-purpose is something that I have passed on to my kids. My kids can't wait until their tomatoes are ready to eat and helped me to plant all my flower and vegetable posts. As many of you know I grow my own herbs. My new herb garden is doing great, so much so that I was swimming in sage last week. I decided the best thing to do with the abundance was to make Blackberry Sage Vinegar. This recipe has three ingredients. It takes 2-3 days total (including time for the berries to soak into the vinegar) and makes one quart sized jar. I followed the recipe almost exactly as written. I did make two jars so I used a total of 14 sage leaves and two containers of blackberries. I filled the blackberries full in the canning jars since I wanted lots of flavor. Make sure to sterilize your jars before making the vinegar. Vinegar shouldn't grow bacteria, but I try to be as safe as a I can with any food prep. I let my jars boil for ten minutes to ensure that they were fully sterilized. After the vinegar was complete I made a funnel out of parchment paper and poured the strained vinegar into a cleaned and sterilized wine bottle. I love how pretty this vinegar looks in the bottle once completed. 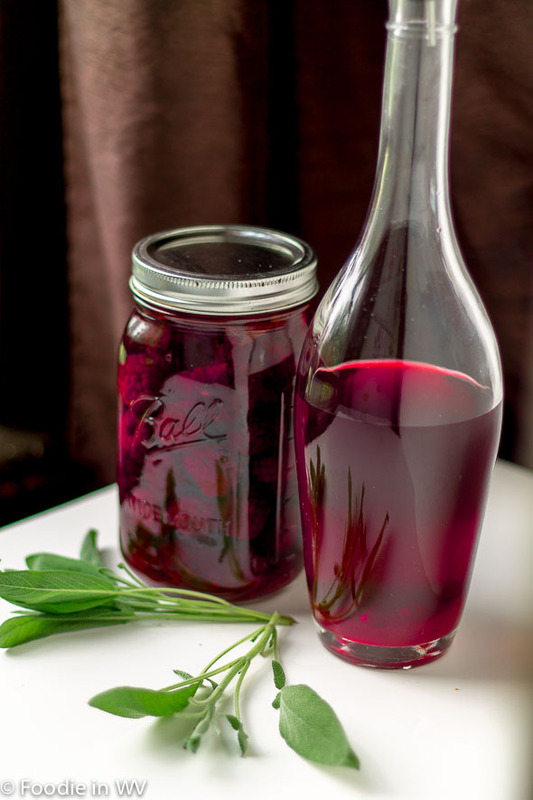 Making homemade flavored vinegar is a great way to use garden herbs and makes a beautiful gift as well. I also made a batch of tarragon vinegar that I will post about later this week. Herbs can be used in a variety of ways and this recipe is a great one! For the recipe go to Blackberry Sage Vinegar. Homemade gifts are the BEST. I don't come from a very "creative" family and rarely get these types of gifts, but when they do come along, I love it. I laughed when I read about your family. My father was Martha Stewart-ish when no one thought homekeeping was cool, and I was raised in a constant state of "projects." I can't wait to try this recipe and I've pinned it -- I use flavored vinegars all the time! My house was in a constant state of projects too :) Especially sewing, my mom had a huge sewing room! Thanks for the pin, I appreciate it! I've never thought of making vinegar. It does look really pretty! It's much cheaper than store bought and tastes great on salads etc. Thanks for the sweet comment :) I agree that whining seems to be a common theme. My youngest is a big whiner, but he is also a cutie! This recipe sounds great, and I like the color! I love the color too, so pretty! Beautiful! A great gift idea! Thanks :) I love making homemade gifts! No problem :) It's really easy too! Wow - that looks terrific! Wonderful gift idea for a person who likes to cook. Thanks :) It would make a nice, easy homemade gift for a food lover! I do too. The though behind them are great! Thanks :) It turned out really great tasting! Thanks :) The color came out nicely! I love the color...so pretty! It does taste great, especially when made into a vinaigrette!